Proper maintenance with 303 Products will add to the life of your fabrics and save you money. Kit contains (1 – 32 oz. Fabric Guard). Powerful enough to protect fabrics in the harshest environment …outdoors. On outdoor fabrics, 303 Fabric Guard restores lost water repellency and stain repellency to factory new levels. 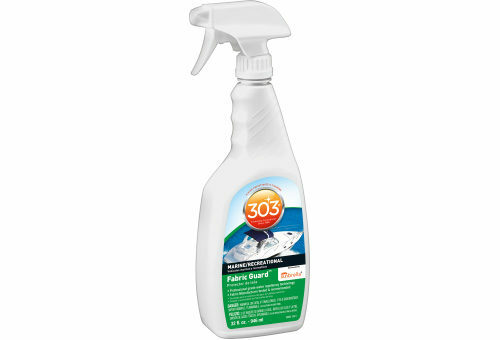 303 Fabric Guard resists soiling, impedes mildew formation and helps protect against the sun’s harmful UV rays. Proper maintenance with 303 Products will add to the life of your fabrics, save you money, and … It’s Easy! 32 oz. Trigger Sprayer / 150 to 200 square feet of coverage. Recommended by Sunbrella® Order No. 61053.